Description: Droll Yankees Classic Window Bird Feeder. 6.5" diameter, 1/2 lb capacity. Droll Yankee Industry Leading Features: *UV stabilized polycarbonate - won't yellow with age, dependably durable. *Sloped cover - overhangs dish and prevents runoff of rain into dish. *Open construction - clear view of birds on the feeder 3 high quality suction cups - hold feeder securely. *Curved rim - makes perching easy. 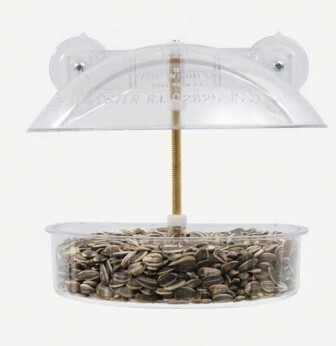 *Deep dish - holds two cups of seed, suet, fruit or mealworms. *Drainage holes - eliminate water from dish.